When it rains, it pours! In tropical Thailand this statement is so true. I really enjoy the rain in Thailand, from watching a thunderstorm roll in from the comfort of my apartment, to being forced to stop, relax and wait out the worst of it on the side of the road or at a food stall with a cold beer. We’ve been caught out in a few downpours over the past week and it seems like every time we say “that’s pretty heavy rain” it just gets heavier. The other night when we were out getting dinner we got caught out without our umbrellas and ended up standing under shelter where we spotted a couple of frogs hopping around – this was a little odd given it was the middle of Bangkok, on Sukhumvit Road (a busy 4 lane road) and the only plant life we could see where a frog might live was in the hedge on the side of the road. It seems Thai’s do there best to avoid the rain as well. I spotted this bit of Thai ingenuity down by the canal on one of our little wanderings. 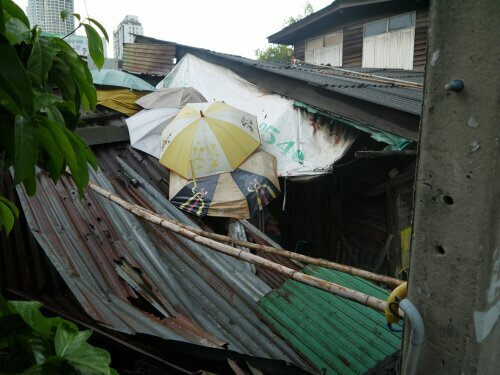 I’m still trying to figure whether the umbrellas were intentionally bought to fill the gap between the tarpaulin and the roof, or whether strangers have just added to it as their umbrella’s broke as they walk past or whether the owner of the little shack underneath has found a way of recycling that prevents his property from getting wet. Though from what we’ve seen umbrellas sometimes help keep you dry but often just get you wet in a slightly odd pattern instead. Those frogs were escaping a nearby kitchen no doubt. Frog legs recipes abound….pan fried with chli & basil looks the go….or perhaps garlic & cilantro….washed down with that cold beer of course! Quite possibly! We’ve definitely seen frogs for sale in the local market, but haven’t yet tried them for dinner!